Please call 949-387-4400 to schedule the lesson with our office. Our Office Hours are Monday – Thursday 9AM to 6PM and Friday 9AM to 5PM. Our Office is closed Saturday and Sunday. However, our instructors’ work 7 days a week, so we can accommodate most appointment times within reason. $45.00 Short notice cancellation / No Show fee will be charged if 24 hours notice is not given on any scheduled appointments. This means you must call and cancel at least 24 hours prior to the appointment time. NO EXCEPTIONS. Please leave messages on our company voice-mail whether it is after hours or on the weekends. Please note there are no refunds once payment has been received. The Online Course and Behind the Wheel packages will expire one year from the date of purchase. We do not guarantee students will pass their written or behind the wheel tests at the DMV. A $25.00 replacement fee will be charged for all lost or damaged completion certificates. The driving lessons/packages are non-transferable and are not prorated. and dangers may be caused by the Minor’s own actions, or inactions, the actions or inactions of others participating in the Activity(s), the rules of the Activity(s), the surface conditions of the roads which are traveled upon for purposes of learning to drive and/or THE NEGLIGENCE OF OTHER DRIVERS, OTHERS USING THE ROADS AT THE SAME TIME AND OF THE “RELEASEES” NAMED BELOW; (c) there may be OTHER RISKS NOT KNOWN TO ME or that are not readily foreseeable at this time; (d) THE SOCIAL AND ECONOMIC LOSSES and/or damages that could result from those Risk(s) COULD BE SEVERE AND COULD PERMANENTLY CHANGE THE MINOR’S FUTURE. I consent to the Minor taking this driver instruction class and participating in all the Activity(s) involved in learning how to drive a vehicle. I expressly acknowledge and agree that the minor does hereby ACCEPT AND ASSUME ALL SUCH RISKS, KNOWN AND UNKNOWN, AND ASSUME ALL RESPONSIBILITY FOR THE LOSSES, COSTS AND/OR DAMAGES ASSOCIATED WITH INJURY, DISABILITY, PARALYSIS OR DEATH IN THE EVENT THER IS AN INCIDENT THAT OCCURS DURING THE DRIVER INSTRUCTION CLASS, EVEN IF CAUSED, IN WHOLE OR IN PART, BY THE NEGLIGENCE OF THE “RELEASEES” NAMED BELOW. I HEREBY RELEASE, DISCHARGE AND COVENANT NOT TO SUE the Varsity Driving School, the owners of the vehicles, the instructors used to conduct the Activity(s), and other persons who give recommendations, directions, or instructions or engage in risk evaluation of the Activity(s)and each of them, their directors, officers, agents, employees, representatives, owners, members, affiliates, successors and assigns, all for the purposes herein referred to as “Releasees,” FROM ALL LIABILITY TO ME, THE MINOR, my and the minor’s personal representatives, assigns, heirs, and next of kin, FOR ANY AND ALL CLAIMS, DEMANDS, LOSSES, OR DAMAGES ON ACCOUNT OF ANY INJURY TO ME OR THE MINOR, including, but not limited to, death or damage to property, CAUSED OR ALLEGED TO BE CAUSED, IN WHOLE OR IN PART, BY THE NEGLIGENCE OF THE “RELEASEES” OR OTHERWISE. NEGLIGENCE OF THE RELEASEES OR OTHERWISE. Both my parents and I believe I am qualified to participate in the Activity(s). I will inspect the vehicle prior to starting the engine and if, at any time, I feel anything to be unsafe including my ability to safely operate vehicle, I will immediately stop and refuse to participate further in the Activity(s). I understand that the ACTIVITIES RELATED TO LEARNING TO DRIVE ARE VERY DANGEROUS and INVOLVE RISKS AND DANGERS OF MY BEING SERIOUSLY INJURED OR HURT, MY BEING PARALYZED OR KILLED. I know that these risks and dangers may be caused by my own actions or inactions, the actions or inactions of others participating in the Activity(s), road conditions and a failure of the Vehicle, and/or the NEGLIGENCE of others on the road or with me in the vehicle, including those persons responsible for instructing me how to drive. I HEREBY RELEASE, WAIVE, COVENANT NOT TO SUE, AND DISCHARGE, ALL OF THE RELEASEES FROM ALL LIABILITY TO ME, my personal representatives, assigns, heirs, and next of kin, for any and all loss or damage and any claim or any demand on account of any injury to me including, but not limited to, my death, whether caused by the NEGLIGENCE of the Releasees or otherwise. PLEASE READ THE TERMS OF THIS DISCLAIMER AGREEMENT (“Agreement”) CAREFULLY BEFORE YOU REGISTER FOR OUR CLASSES. I ACKNOWLEDGE, agree, and represent that: I understand the nature of the activity and that I am over 18 years of age, qualified, in good health and in proper physical condition to participate in the classes offered by Varsity Driving Academy. I further agree and warrant that if at any time I believe conditions related to the instructions I am being given, the vehicle I am driving or road conditions to be unsafe for myself, I will immediately discontinue further participation in the activity. I understand that driving an automobile as well as taking instructions to learn how to drive is an inherently dangerous activity and that by getting behind the wheel of a vehicle as a participant in this driving instruction class (Hereafter the Activity) I understand I am at risk that I could sustain physical injury. As such, I undertake upon myself to fully indemnify Varsity Driving Academy to the greatest extent allowed by law for any and all damages, regardless of nature and/or cause, that I may negligently, willfully or recklessly cause or contribute to. This includes mechanical and body damage to the vehicles due to my incorrect operation of the same, as well as my failure to follow proper procedures and instructions. For good and valuable consideration, the receipt and sufficiency of which are hereby acknowledged, the parties hereby agree as follows: Every student is different and may respond in a different manner to the techniques, instruction, methodology or processes that may be taught or provided to the student. Our services, techniques, instructions, methodology and processes are provided “as is” and without guarantees or warranties of any kind, expressed or implied, including without limitation, any implied warranties of merchantability or fitness for a particular purpose. We do not warrant or guarantee (a) that our services will meet your expectations or requirements, or (b) the outcome, results or success of our services. We do not guarantee the accuracy or completeness of the information provided by us or in our materials or on our website. We may make updates, improvements, and/or changes to our services, materials, and website at any time without notice to you. 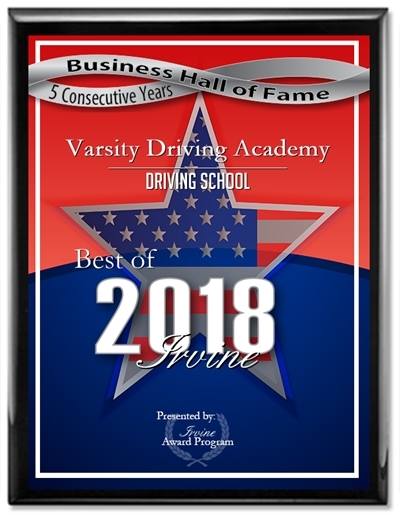 Varsity Driving Academy shall not be liable in the event of incidental, consequential, special or exemplary damages in conjunction with, or arising out of, the use or performance of the services or any techniques, instructions, methods or processed that may be taught or provided by us. These Risks and dangers may be caused by either or all of the following: my own actions or inactions; and/or the actions or inaction of others participating/observing or otherwise being involved in the activity; and/or the road conditions in areas where the activities were I will be taken in order to learn to drive a motor vehicle take place. I expressly disclaim all warranties, express or implied, as to fitness for a particular purpose. The negligence of Varsity Driving Academy, it’s instructors as well as the officers, directors, agents, employees and assigns Hereinafter collectively referred to as “RELEASEES”. There may be OTHER RISKS INCLUDING ECONOMIC LOSSES either not known to me or not readily foreseeable at this time. I FULLY, FREELY AND VOLUNTARILY ACCEPT AND ASSUME ALL THE RISKS from participating in or observing the activity(s) associated with learning to drive and the instructions related to the activity including the acts and omissions of other students participating in the activity (s). You hereby release, acquit, and forever discharge Varsity Driving Academy, their officers, staff, members, employees, volunteers, lessors, associates, successors or assigns from any and all liability, claims, demands or causes, which may arise from the observation, attendance, participation and or instruction in a Varsity Driving Academy drivers education class or course or from any injury sustained by you, whether or not due to negligence of any kind. I COVENANT TO NOT SUE, AND I RELEASE AND DISCHARGE THE “RELEASEES” FROM ANY AND ALL LIABILITY, CLAIMS, DEMANDS, LOSSES, OR DAMAGES ON MY ACCOUNT CAUSED OR ALLEGED TO BE CAUSED IN WHOLE OR IN PART BY THE NEGLIGENCE OF THE “RELEASEES”. You hereby consent, give and grant the right to photograph my physical likeness in any manner we desire, use your name, and the right to reproduce your voice (or substitute and dub in foreign languages the voice of others) for use in and in connection with promoting, advertising, marketing of pictures or stories related to participation in Varsity Driving Academy events or courses, and the exhibition of such pictures/video theatrically, by television, or by any other means now existed or hereafter used or conceived. You expressly understand and agree that the pictures/videos, films, recordings, prints and copies thereof and all rights therein, and all results and proceeds of your appearance in connection herewith shall be our sole and absolute property for any and all purpose whatsoever in perpetuity, and we, our licensees, agents, representatives, successors and assigns shall have the unlimited right throughout the world to exhibit said pictures/videos or any part thereof, and by any manner or means, including, but not limited to, the right to rerun said pictures/videos on television and to exhibit the pictures/videos theatrically throughout the world subject to no further payment or obligation whatsoever. You further consent, give and grant us the right to use your name and/or likeness and/or biographical data, for use in and in connection with the credits, advertising and exploitation of said pictures/videos. Your warrant that you are an adult and have every right to enter into this agreement or if under the age of 18, agreement is being signed by parent or authorized agent to minor child. Nothing contained herein shall obligate us to use your name or likeness or anything else granted herein. You hereby acknowledge that we, our employees, your agents, agents’ employees, and representatives have made no promises, expressed or employed, oral or written, or otherwise except as contained herein. I AGREE THAT: Any dispute or difference of any kind whatsoever arising out of, relating to or in connection with this contract, whether in contract, tort, statutory, or otherwise, including any questions as to the existence, scope, validity, breach or termination of this agreement in its entirety or part, shall be finally settled by binding arbitration, conducted pursuant to the Judicial Arbitration and Mediation Services(JAMS) rules by a single Arbitrator. Arbitration shall be held in Orange County, California; Arbitrators shall apply law indicated in the “Choice of Law” provision of the present agreement. Costs of arbitration shall be equally divided among the parties. This provision shall be binding upon the signing party as well as their executors, estate, and next of kin. ARBITRATION INVOLVES THE WAIVER OF THE RIGHT TO A JURY TRIAL. BY EXECUTING THE PRESENT AGREEMENT ALL PARTIES AGREE TO BE BOUND BY THE PROVISIONS OF THE PRESENT SECTION, AND AGREE TO WAIVE THEIR RIGHT TO A TRIAL IN A COURT OF LAW. I AGREE THAT any party’s waiver of any breach or failure to enforce any of the terms and conditions of this Agreement at any time shall not in any way affect, limit or waive such party’s right thereafter to enforce and compel strict compliance with every term and condition hereof. I AGREE THAT this Agreement constitutes the complete, final and exclusive agreement among the parties hereto and supersedes and cancels any and all prior communications and agreements between the parties with respect to the subject matter hereof. I FURTHER AGREE THAT the present agreement excludes future modification except by signed writing, and that this agreement may not otherwise be modified. Finally, you agree that you will, and that it is your exclusive and personal responsibility to, drive safely and comply with all laws and regulations when driving or on the road.